In this Python tutorial, we will learn how to check if a number or word is palindrome or not using Python. With this tutorial, you will also learn how to check palindrome ignoring the case of characters in a string in Python. 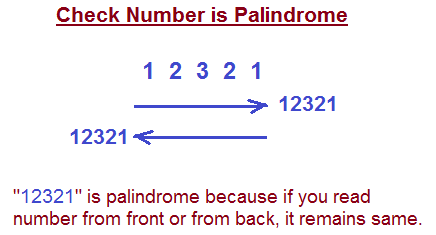 Palindrome Check: The process to check whether a given word or number is equal to it’s reverse or not, e.g., abcba, 96569 etc. It requires to reverse the number or word first and then check whether it is equal or not. In python programming, it’s not too difficult to find the reverse of a word or number. The following is the code snippet and the outputs written in Python3. reverse="".join(reversed(item)) #reversal of the input"
YES, the entered item is palindrome. NO, the entered item is not a palindrome. If we reverse this string we will get madaM. But as this is not similar to the first string, Madam – It will be considered as a non-palindrome number. But we want to make it considered as a palindrome. So what will we do? We will simply convert all the characters to either upper case or lower case then we will reverse it. After that, we will compare the reversed string to the new converted string.